Baton Rouge, La. 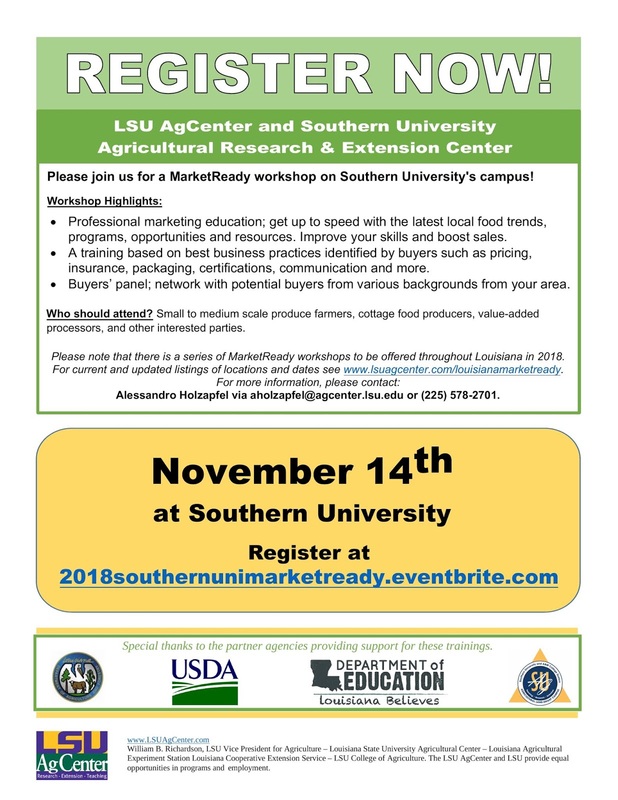 – The Southern University and LSU Ag Centers will co-host a MarketReady Workshop for small to medium scale produce farmers, cottage food producers, and value-added processors. 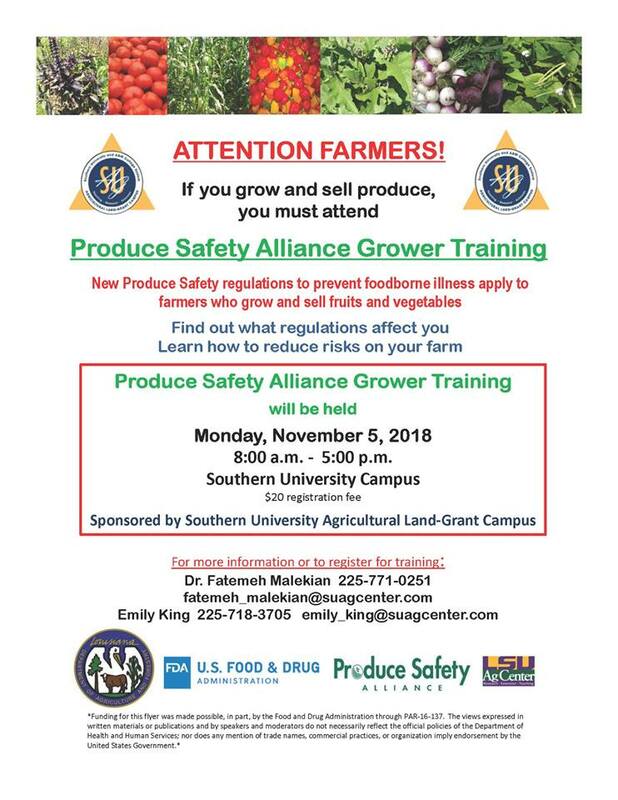 The free professional training will be held from 8:30 a.m. – 3:30 p.m. on Nov. 14 at the Felton G. Clark (F.G. Clark) Activity Center on the campus of Southern University. · Improve their marketing skills and boost sales. · Use key business functions to set pricing, insurance, packaging, certifications for their produce. · Network with potential buyers from various backgrounds. The workshop is free and open to the public, but pre-registration is required. To pre-register, visit http://2018southernunimarketready.eventbrite.com. For additional information or if you have dietary restrictions, contact Alessandro Holzapfel at 225-578-2701. Baton Rouge, La. 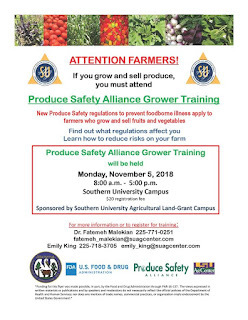 – The Southern University Land-Grant Campus will host a Produce Safety Alliance Grower’s Training from 8 a.m. – 5 p.m. on November 5 in room 110 of T.T. Allain Hall, on the Southern University Baton Rouge campus. Baton Rouge, La. 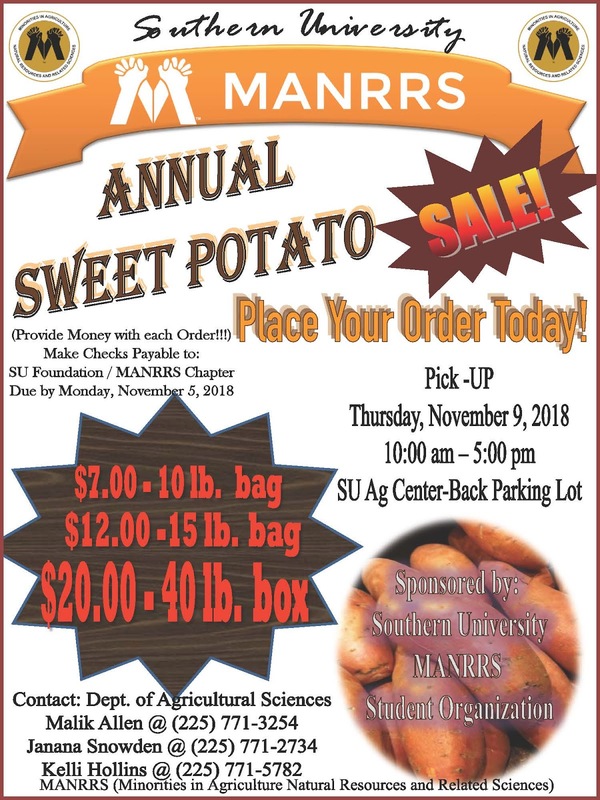 – The Southern University chapter of the Minority in Agriculture Natural Resources and Related Sciences (MANRRS) - a student organization - is currently taking orders for its Annual Sweet Potato Sale. 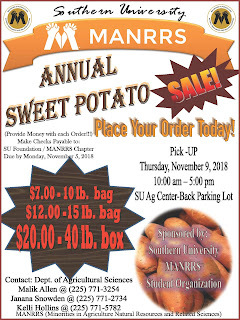 Individuals can purchase 10, 15 or 40 pound bags/boxes of sweet potatoes for $7, $12 or $20, respectively. Payment is required with your order in the form of cash, checks and money orders. Checks and money orders should be made payable to the SU Foundation/ MANNRS Chapter. The deadlines to place an order is November 5. Pick-ups will occur Thursday, November 9 from 10 a.m. to 5 p.m. at the SU Ag Center – A.O. Williams Hall - back parking lot. For additional information contact, Malik Allen, Dr. Janana Snowden or Kelli Hollins at 225-771-2242. Dawn Mellion-Patin, Vice Chancellor for Extension and Outreach at the Southern University Ag Center, has been named the recipient of the 2018 George Washington Carver Distinguished Service Award by Iowa State University's College of Agriculture and Life Sciences. Baton Rouge, La. – Southern University Agricultural Research and Extension Center’s Vice Chancellor for Extension and Outreach, Dawn Mellion-Patin, Ph.D., has been named the recipient of the 2018 George Washington Carver Distinguished Service Award by Iowa State University’s College of Agriculture and Life Sciences. Patin received the award during the annual Honors and Awards Ceremony on October 26. Baton Rouge, La. 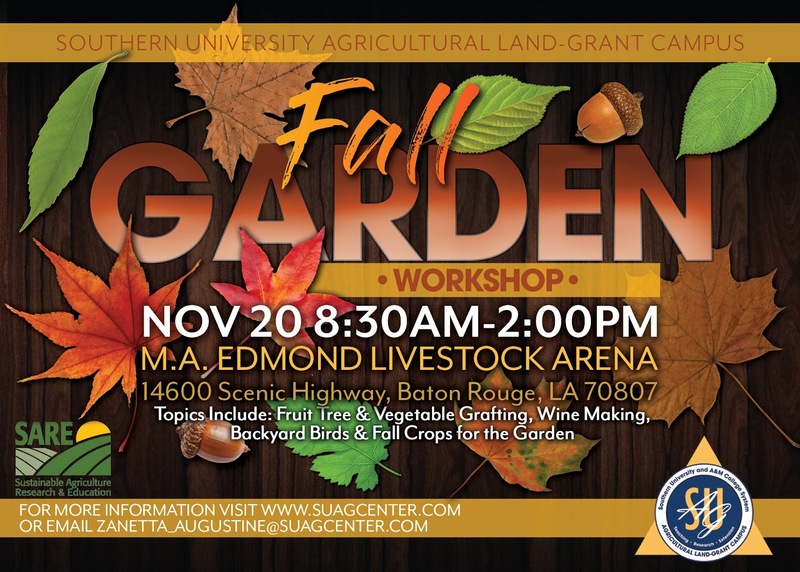 – The Southern University Ag Center will host its Fall Garden Workshop on Tuesday, November 20 from 9 a.m. – 2 p.m. at the M.A. Edmond Livestock Arena, 14600 Scenic Highway, in Baton Rouge, LA. “We are inviting teachers, community garden coordinators, backyard gardeners and anyone interested in gardening to attend this workshop,” said Dawn Mellion Patin, Ph.D., Vice Chancellor for Extension and Outreach at the SU Ag Center. “This is also a great opportunity for residents who live in food deserts to come out and learn how to grow their own fruits and vegetables,” added Patin. For additional information, contact Zanetta Augustine, Mila Berhane or Stephanie Elwood at 225-771-2242. Baton Rouge, La. 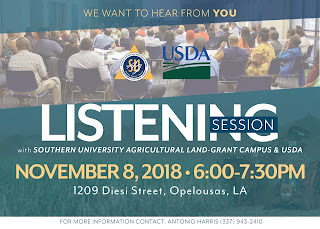 - Opelousas residents and individuals from surrounding areas are invited to attend a Listening Session hosted by the Southern University Land-Grant Campus and the U. S. Department of Agriculture at 6 p.m. on November 8 at the Sustainable Agricultural and Rural Development Institute (SARDI), located at 1209 Diesi Street, in Opelousas, La. 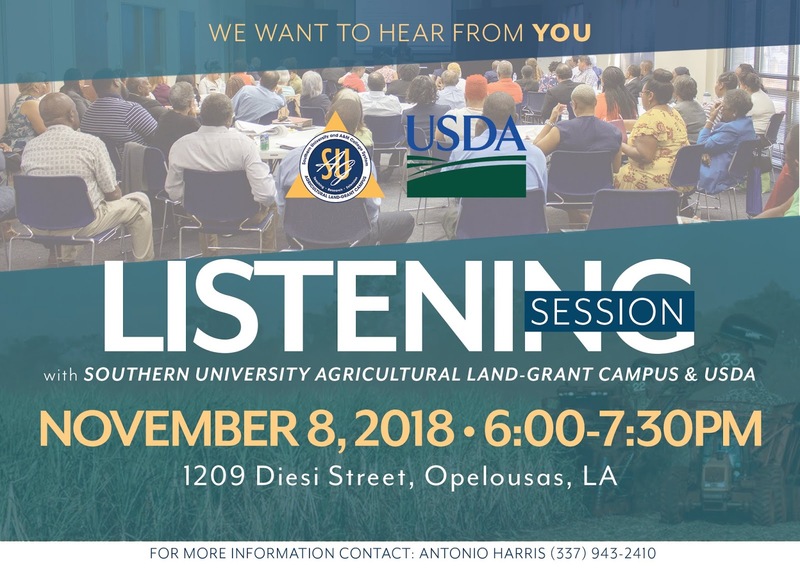 For additional information about the Listening Session in Opelousas, contact the Sustainable Agricultural and Rural Development Institute at 337-943-2410 or email sardi@suagcenter.com. Baton Rouge, La. 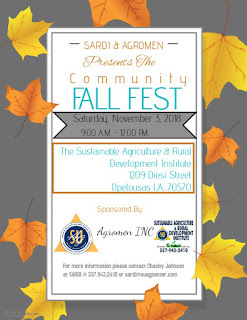 – The Sustainable Agricultural and Rural Development Institute (SARDI) has partnered with Agromen Inc., to host a Community Fall Fest on November 3. The free event will be held from 9 a.m. – 12 p.m. at SARDI’s office, located at 1209 Diesi Street, in Opelousas, La. The fest will cover the agricultural topics of sustainability, marketing, health, farm safety and Fall resources. There will also be several demonstrations on brewing Hibiscus Tea, planting fall crops and caring for farm animals. Representatives from the USDA’s Farm Bureau, Farm Service Agency (FSA) and Natural Resources Conservation Service (NRSC) will also conduct sessions during the Fall Fest. Agromen Incorporated is a non-profit agricultural organization in St. Landry Parish. The organization, which has been in existence for 25 years, consist of professional African American men who assist the community with agricultural related topics. Each year the organization holds an annual field day in St. Landry Parish. 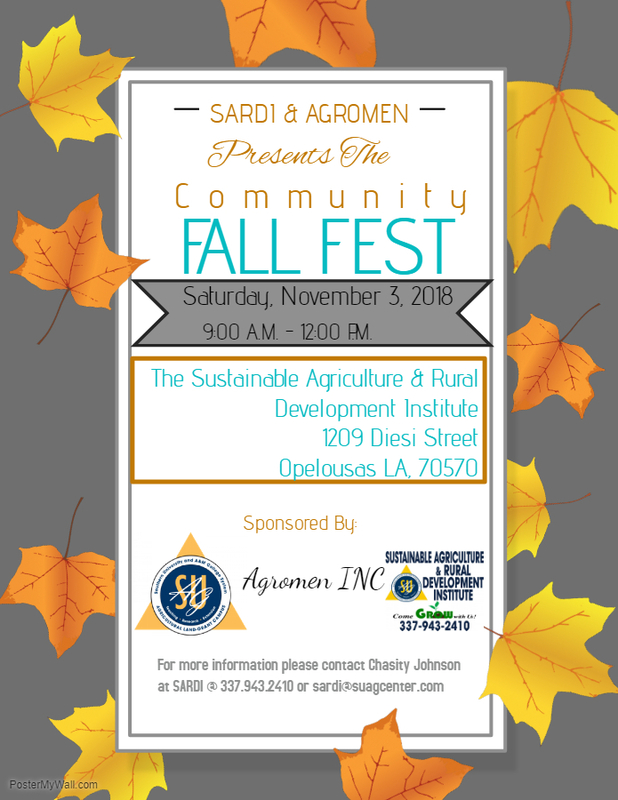 For additional information or to pre-register for the Fall Fest, contact Chasity Johnson at 337-943-2410 or email sardi@suagcenter.com. The Southern University Land-Grant Campus held a Listening Session in the Town of White Castle on Oct. 9. Information gathered during the session will be used to implement strategies, seminars and workshops to aid the community. Baton Rouge, La. – Nearly 50 Iberville Parish residents along with Southern University Land-Grant Campus and United States Department of Agriculture (USDA) employees attended a Listening Session on October 9 at the Town of White Castle’s Community Center. The event, which was hosted by the SU Land-Grant Campus and the USDA, was held to hear the needs and concerns of the town’s citizens. Information gathered during the session will be used to implement strategies, seminars and workshops to aid the community. “The whole intent of the listening session is to listen to what the citizens need and figure out how to take care of those needs,” said Bobby R. Phills, Ph.D., Chancellor-Dean of the Southern University Land-Grant Campus. The session consisted of a panel of Vice Chancellors from the Southern University Land-Grant Campus and representatives from several USDA agencies. Residents were able to submit written questions, as well as ask questions directly to the panel. Many of the questions asked pertained to the USDA’s Farm Bill, USDA’s housing assistance programs, school and community gardening and youth enrichment programs. 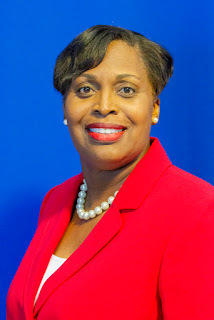 “We will provide two youth from the Town of White Castle the opportunity to participate in our ‘Cultivating Leadership Innovation by Motivating Agricultural Talent Education’ (CLIMATE) Program,” said Dawn Mellion-Patin, Ph.D., Vice Chancellor for Extension and Outreach at the SU Ag Center, when asked about assistance for youth in the Town of White Castle. “This is a five week residential program for high school students which aims to improve ACT scores and introduces the students to careers in the agricultural industry,” she added. White Castle Mayor Gerald Jermarr Williams provided greetings to the attendees; White Castle Mayor-Pro Temp, Barbara O’Bear, provided a welcome and presided over the program and Phills introduced the panelists and moderated the session. The White Castle Listening Session was the first of several sessions that will be held throughout the state in the coming months. 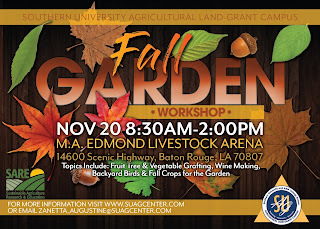 For additional information about the Southern University Land-Grant Campus and its programs and services, visit our website at www.suagcenter.com or call us at 225-771-2242. Photos from the listening session are available here. Baton Rouge, La. - White Castle residents and individuals from surrounding areas are invited to attend a Listening Session hosted by the Southern University Land-Grant Campus at 6 p.m. on October 9 at the White Castle Community Center, 32725 Bowie Street. For additional information about the Listening Session in White Castle, contact the Office of the Chancellor for the Southern University Land-Grant Campus at 225-771-2242.